SJVN Limited is a mini ratna PSU and a joint venture between the Government of India and the Government of Himachal Pradesh. The company operates a 1500MW hydro power station at Nathpa Jhakri. The company's generation capacity is expected to increase soon with upcoming projects at Rampur (412 MW). Apart from this the company owns a 16% stake in the 4000MW solar power plant in the Sambhar area of Rajasthan. SJVN in total has projects lined up for clearance which could take it's production up to 5492 MW in the coming years. 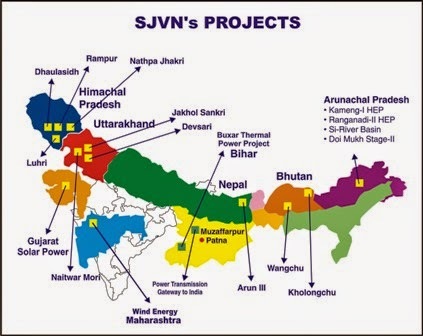 SJVN via it's subsidiary SJVN Thermal Pvt Ltd has ventured into thermal power by taking up the 1320MW Buxar Thermal power plant project. The results of the company have been fairly flat, being Rs. 1,769.74 crores in 2010 and Rs. 1,873.58 crores in 2014. The company enjoys a huge OPM of 85%-90% and NPM of around 50%. It posted net profits of Rs. 1,114.63 Crores for FY 13-14. With the Rampur project close to total commercial operations commencement by June, 2014, the revenues are expected to give a significant boost of around 20%. With BJP getting a complete majority and the emphasis on power sector by Prime Minister Narendra Modi, we expect this sector to see major reforms and faster executions. SJVN is expected to benefit significantly from any boost given to the power sector. The management of the company boasts of being technology friendly and are determined to achieve a Navratna status from the current Mini Ratna. As on 31st March, 2013 the total debt of the company stood at Rs. 1,876.27 Crores while Reserves stood at Rs. 4,273.38 Crores. The company is not heavily debt laden and has a healthy reserve. The downside for the stock is that it depends on good monsoons to feed the rivers. With the EL-Nino effect said to be in play, the company could face a hit in meeting it's expectation of a 20% growth. We expect that soon PSU's will also need 25% non promoter holdings and divestment by the Government can be seen in SJVN for treasury needs. Long term investors can buy SJVN around current levels of 25 and add on any dips and hold this stock in their portfolio for the coming years. The stock is only for those investors who can wait patiently for many years, those with a view of just 12-18 months have other stocks to look out for in the power sector. SJVN is a strong company in the non-conventional energy sector. Note: This post may be updated time to time with the latest figures. DalalStreetBulls is not responsible for any losses incurred based on any action taken on the above information. This article doesn't constitute an offer to BUY/SELL any security. Hero Moto Corp reported 3.44 per cent decline in its standalone net profit for the fourth quarter ended March 31, 2014 at Rs 554.43 crore. Amara Raja Batteries reported 34.31 percent increase in net profit at Rs 80.05 crore for the fourth quarter ended March 31, 2014. This is the perfect post for anyone who wants to know about this topic , I have known very important things over here,Also very nice info shared by you.